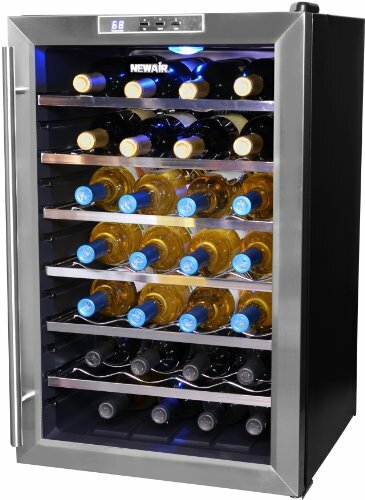 The EdgeStar 30-bottle wine cooler is a sturdy, single zone model with lockable door and designed for built-in placement. With its narrow 15-inch width it fits nicely in the place of a kitchen trash compactor under the counter. 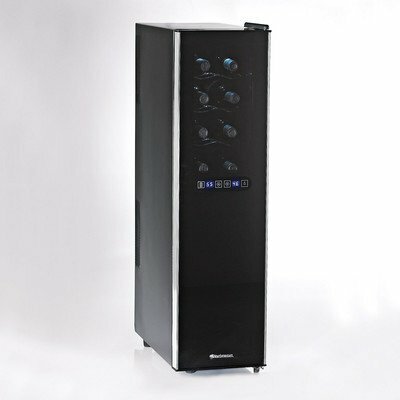 The EdgeStar 30 bottle wine refrigerator is a good-looking appliance with its black cabinet, wood fronted, slide-out metal shelves and the stainless steel framed glass door tinted with black dots. The door handle can be mounted with a few screws (included with the appl.) either on the right or left hand side of the door. The blue interior light displays the wine bottles nicely without generating much heat. 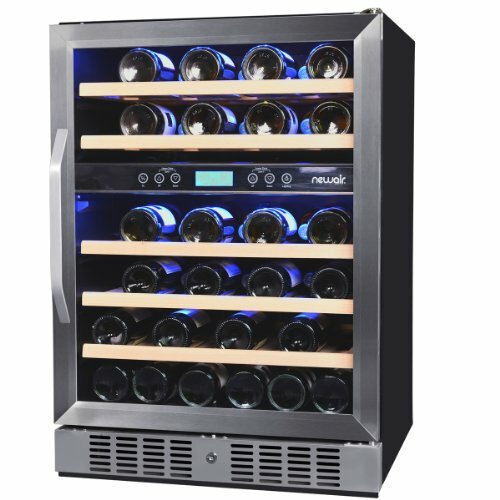 The wine fridge is equipped with carbon air filter that should be replaced in every 3-6 months depending how dusty or odorous the air is ( if the fridge is in the kitchen with lots of cooking going on then a 3-month replacement period is recommended to ensure clean, odorless air inside the cabinet. Slide-out metal racks with natural wood trim in the front. 6 larger metal shelves and 1 smaller shelf: each one can hold 5 bottles (regular size, Bordeaux style): 3 with the neck facing out 2 with the neck facing in. All shelves can be completely removed should you wish to make room for larger, odd shape bottles or champagnes. two displays: one shows the Set Temp. the other the Current Temp. Shelving: 6 full-size glide-out metal shelves with elegant natural wood trim + 1 smaller slide-out shelf (metal with wood front). The temp. range of the cooler is from 40 to 65°F which is pretty wide, allowing to set low temperatures to chill whites and sparkling wines. You can set the temperature by pressing the Up and Down arrows on the electronic control panel. One press increases or reduces the temp. by 1 degree. You can also switch to Fahrenheit to Celsius display and back: to do that press and hold the Up and Down arrows simultaneously for cc. 5 seconds. There is also a button to turn on and off the soft interior lighting. The Run light on the left of the control panel indicates whether the cooler is running. Press and hold the Power button for approx. 3 seconds if you want to shut the unit off. 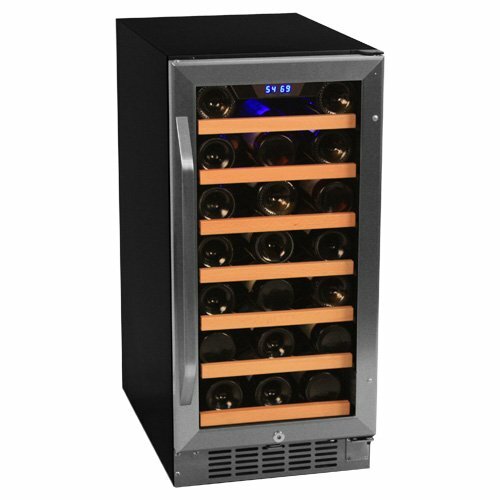 The wine cooler is delivered fully assembled except the stainless steel bar handle that you can screw in on either side of the door. The refrigerator plugs into standard 3-prong electric outlet (proper grounding that meets the requirements of National Electrical Code and any local codes is required): 115 VAC, 60 Hz. Before installing and plugging in the wine cooler, let it stand upright for approx. 24 hours to allow the compressor oil and refrigerant to settle. You can use it freestanding or built-in on a strong, even flooring that can hold the unit even fully stocked. Leave space for ventilation at the back and the sides even if you use it as freestanding. In case you build it in existing furniture, make sure to leave enough space at the back (cc. 2/5″) and around the sides (cc. 1/5″) for adequate ventilation. Do not install it in a fully closed cabinet, behind a door. Adjust level placement by turning the front legs (turn right to raise a side, or left to lower it). if you shut the unit off or there’s a power failure it resets to factory temp. 8around 55°F so you have to set it again. Shelving is a bit tight so it is difficult to get to the bottles in the back. one of the best units in this price range ($500 – $600). 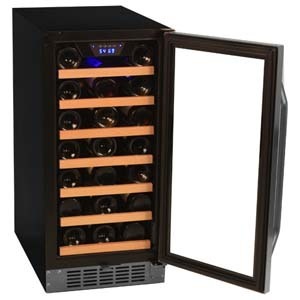 The Edgestar 30-bottle built-in wine refrigerator is a great buy: even if it is hard to stock it up to the advertised 30 bottle capacity, it provides proper storage for approx. 20-25 bottles. Attractive in design and functions pretty well. Not very noisy, as many other similar wine storage coolers are. A perfect fit for starting-out wine collectors who don’t want to spend thousands on a high-end wine cabinet. 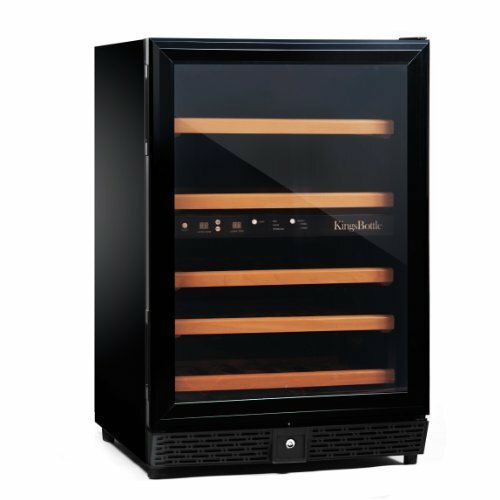 TIP: for a slightly more capacious unit for the same $/bottle price, check out the KingsBott 50-Bottle Wine Refrigerator.